Upholstered in durable, quality, easy to care for cream coloured material, this bar stool holds up to the real wear and tear that happens at meal time. 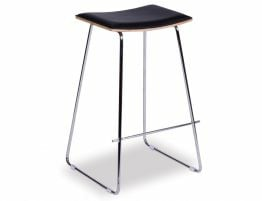 Because this barstool is so easy to care for, it is a customer favourite in high traffic kitchens and busy spaces.The Cantona is a barstool that is designed to be used, sat on-- not just looked at. This barstool is a design masterpiece, especially if you favour a clean, polished modern look. 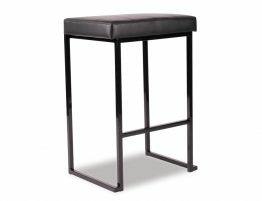 The Cantona counter bar stool features a stationary seat constructed with plush foam padding making it nice to sit in. The seat is finished with careful stitching in a cream upholstery that wipes clean like leather with less care. The Cantona café barstool has a fixed seat height and robust brushed stainless steel welded legs for the stability you need. The Cantona kitchen barstool would pair beautifully with a tall café table or an urban, Soho inspired, brushed stainless steel counter style. With clean lines and a tony form, this barstool fits in nicely with many design esthetics from the more contemporary to elegant and refined. The Cantona cream coloured bar stool, with its light seat and brushed stainless steel frame will enliven your space. Put our cream toned barstool in your kitchen, breakfast bar, counter seating and more. The seat material wipes clean, and holds up to every day use rendering the modern Bar stool ideal for high traffic kitchens or oft used spaces. 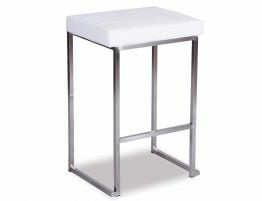 The Cantona modern, minimalist bar stool has a stainless steel frame & plush, cream coloured padded seat. With floor-protecting glides & a chic, modern sensibility, this bar stool is perfect for your kitchen bench or counter seating. 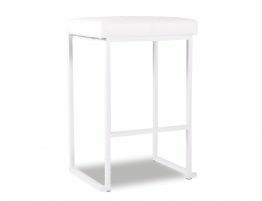 Yes you can have light coloured barstools with our easy to care for Cantona. 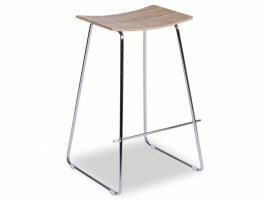 Our Cantona stationary barstool looks expensive and is precisely constructed yet priced to make it easier to do the updates you want. 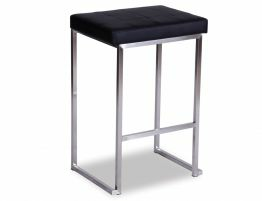 The modern commercial bar stool offers instantly updates your interiors with its stitched cream coloured seat cushion and gleaming brushed stainless steel frame.